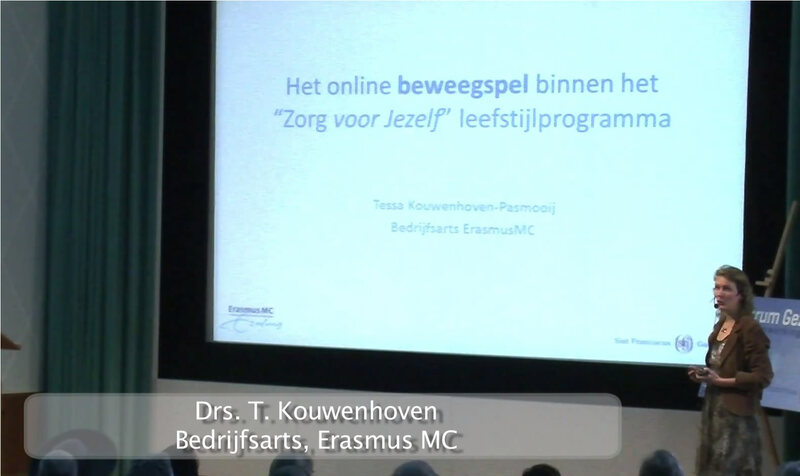 Tessa Kouwenhoven, company doctor of Erasmus Medical Centre in Rotterdam, an organization with 13.000 employees has started a new e-health initiative to fight obesity amongst their employees. This presentation was given at the opening of the Centre for Healthy Weight in Rotterdam (starting at 9:10 in the YouTube video, in Dutch). In the movement game the Activ8 Physical Activity Tracker is used. Reasons for choosing Activ8 were it’s validated classification of movements (lying, sitting, standing, walking, cycling & running) in combination with its accuracy and price. Statistics show that about 10% of all employees in a typical organization are obese, in an organization like EMC Rotterdam this adds up to about 1300 people. The movement game attempts to make it fun to move more by merging self-obtained quantified data and gamification elements. It is especially important to keep people engaged over longer periods so that new, more active, behavior really becomes intrinsic. The e-health program consists of 5 workshops and a movement game in which people need to move in two groups in a virtual journey of 5 months around the world. First results show engaged and happy people who have structurally increase their daily activity levels and also good results on weight reduction (although this is still somewhat preliminary). At the moment long term effects and results are being studied along with a broader introduction of the movement game program for certain patient groups, children and the movement game is also been made available to other companies.